^ a b c Kolga 230-34. Chaussonnet, Valerie. Native Cultures of Alaska and Siberia. Washington: Artic Studies Center, 1995. Friedrich, Paul, and Norma Diamond, eds. Russia and Eurasia/China. Boston: Hall, 1994. Vol. 6 of Encyclopedia of world Cultures. Ed. David Levinson. 9 vols. Kolga, Margus. The Red Book of the Peoples of the Russian Empire. Tallinn, Estonia: NGO Red Book, 2001. Gall, Timothy L. Worldmark Encyclopedia of Cultures and Daily Life. Detroit: Gale Research, . Kennan, George. Tent Life in Siberia. 1870. ———. "Über die Koriaken u. ihnen nähe verwandten Tchouktchen." But. Acad. Sc. St. Petersburg, xii. 99. Jochelson, Waldemar. The Koryak. New York: AMS, 1975. Jochelson, Vladimir Il'ich, and F. Boas. 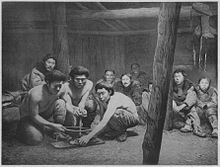 Religion and Myths of the Koryak Material Culture and Social Organization of the Koryak. New York: [s.n. ], 1908. Nagayama, Yukari ed. The Magic Rope Koryak Folktale. Kyoto, Japan: ELPR, 2003.